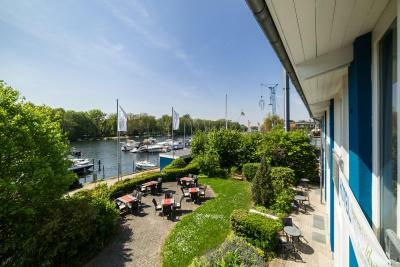 Lock in a great price for Hotel Spree Idyll – rated 9 by recent guests! Beautiful place on the river bank. Modern stylish equipment. Nice and clean. 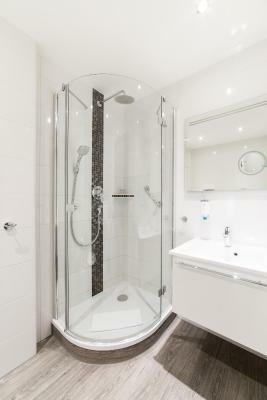 Beautiful bathroom with spacy shower. Wide range of choice at breakfast. Very helpful and pleasant staff. 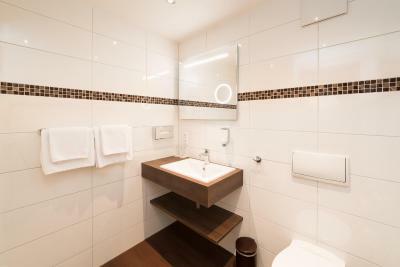 I was very impressed and recommend stay here to others. 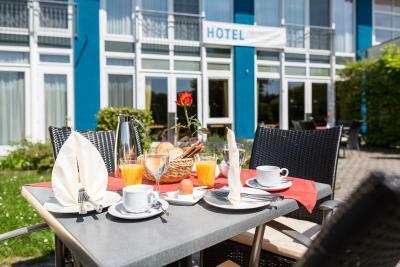 Nice room, good breakfast options, nice location by the lake. Comfortable very clean rooms. 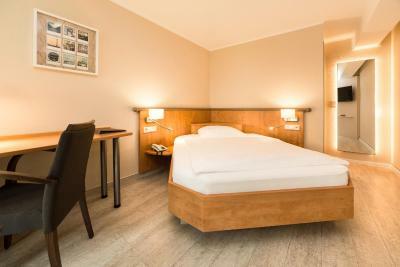 Large room and good Wifi. Very friendly staff. Excellent breakfast - good variety (fried, scrambled and soft boiled eggs, ham, cheese, salmon, fruits, yogurt, etc. ), fresh ingredients, good coffee. Very clean. Good sized room (at least for one person) with comfortable bed. Free parking. Excellent WiFi - you can even skype, watch YouTube videos without lag. Quiet surroundings - my room was next to the reception and I didn't here a peep. I could sleep until 7:00 o' clock without any problems. A good choice of restaurants just a 10-15 min. walk away. A cozy hotel, driven by a family. 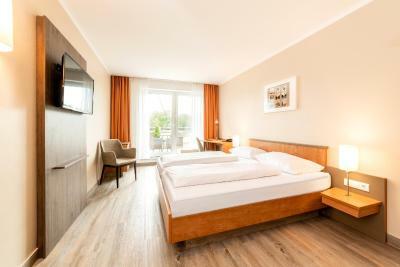 Really nice room, serviceminded and friendly staff. The reception close at 9 pm, so the guests have their own key to use at the front door. Nice area, quiet, 30 min by S-bahn to the city-centre, no problem as it leaves every 10 min. Good breakfast! We had to leave very early Sunday morning, and expected to have breakfast at the airport. The hotel started breakfast at 6.30 am, instead of 7.30 am (later on Sundays), just so we could eat before we left. Will definitely come back, and recommend this hotel to others. 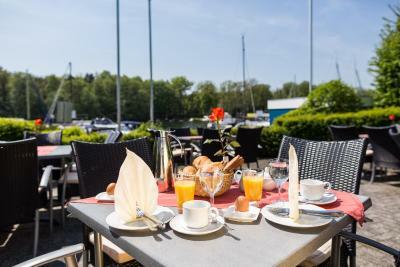 Very clean, friendly staff, many options for breakfast, all of them very tasty, nice, quiet location - on the river banks, where people park their yachts. 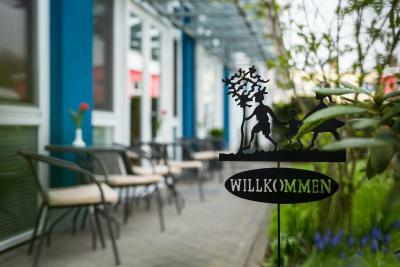 An oasis of tranquility in Berlin, close to Schonefeld Airport. 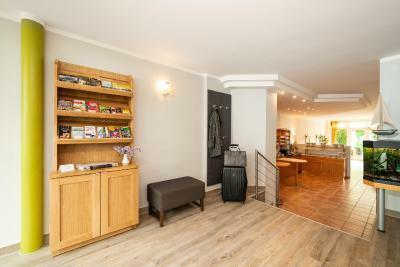 20-30 minutes drive to the city center, very close to public transport. Nach einem sehr leckeren Frühstück kann man ganz in der Nähe mit der Straßenbahn zu den gewünschten Ausflugszielen starten. Alle Mitarbeiter achten sehr auf Freundlichkeit, Hilfsbereitschaft und Sauberkeit. 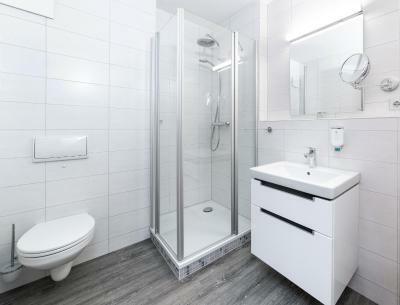 Unser Zimmer zur Flußseite war sehr ruhig, die Betten bequem, das Bad mit einer Top-Dusche ausgestattet, wie man sie nur selten in Hotels dieser Klasse findet, einfach spitzenmäßig !! Hotel Spree Idyll This rating is a reflection of how the property compares to the industry standard when it comes to price, facilities and services available. It's based on a self-evaluation by the property. Use this rating to help choose your stay! 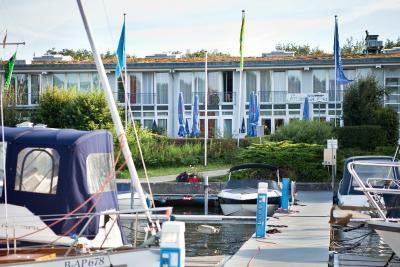 This 3-star hotel is part of the Wassersportzentrum Berlin water sports center, located directly beside the River Spree. 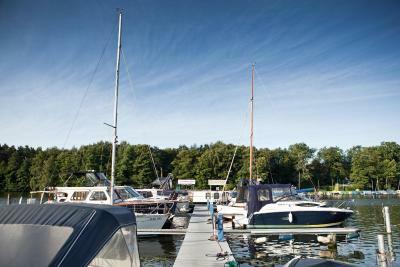 Free WiFi and a sauna with fitness room for a surcharge are offered here, and boats can be rented nearby. 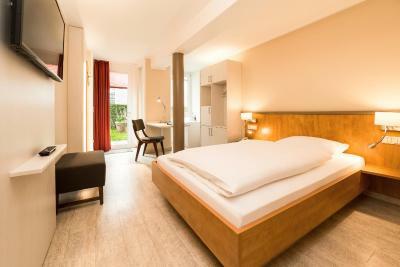 The nonsmoking Hotel Spree Idyll has spacious rooms and apartments with SkyTV and mini-bar. Rooms in the second hotel building feature a balcony. 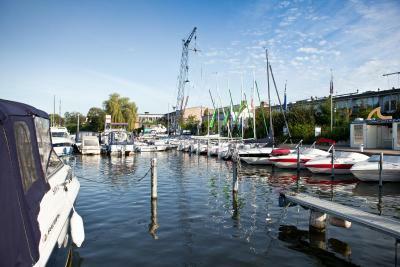 Parking is free at the Spree Idyll. 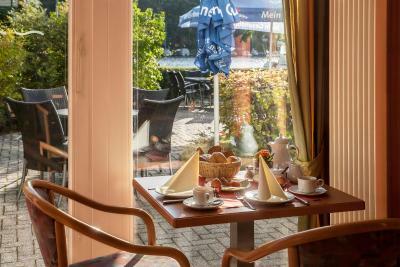 Drivers are only 5 minutes from the Old Town district of Köpenick and 10 minutes from the Kindl-Bühne Wuhlheide concert venue. 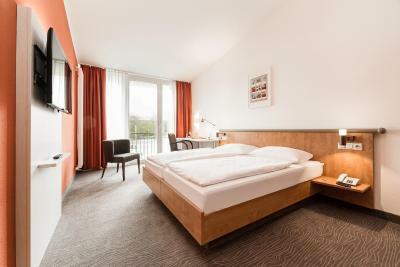 Berlin city center is a 30-minute drive away. Treptow-Köpenick is a great choice for travelers interested in city trips, sightseeing and tourist attractions. 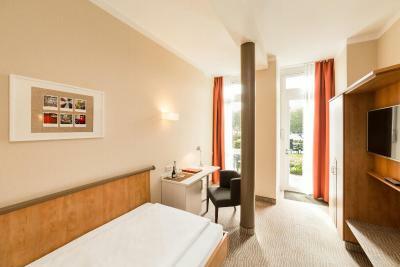 When would you like to stay at Hotel Spree Idyll? 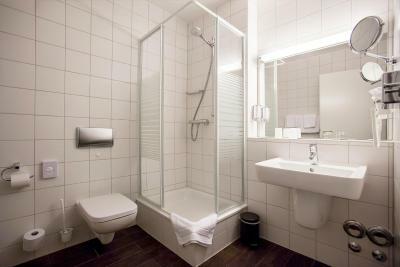 Bright and warmly decorated room offers cable TV, mini-bar and a private bathroom. 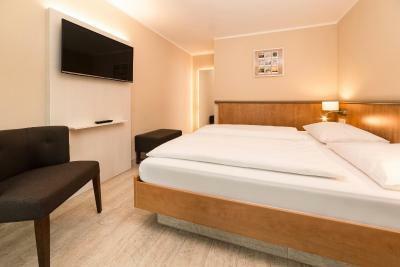 Bright and spacious room includes cable TV, minibar and a private bathroom. 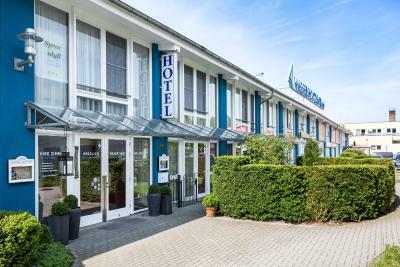 Hotel surroundings – This neighborhood is a great choice for travelers interested in city trips, sightseeing and tourist attractions – Check location Great location - show map Guests loved walking around the neighborhood! House Rules Hotel Spree Idyll takes special requests – add in the next step! Hotel Spree Idyll accepts these cards and reserves the right to temporarily hold an amount prior to arrival. 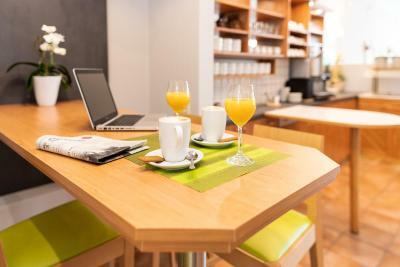 Please note that the breakfast room, the reception and some bedrooms are located in the main hotel building. 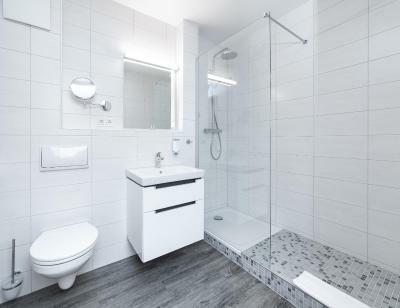 Further bedrooms are located in a second building, only 100 feet away. Each of these rooms features a balcony. Please note there is a small charge for the sauna and fitness area. Please inform Hotel Spree Idyll of your expected arrival time in advance. You can use the Special Requests box when booking, or contact the property directly using the contact details in your confirmation. The building/some attachment is still under construction , there were workers with their machines on the roof/ nearby . But didn’t bother us much . 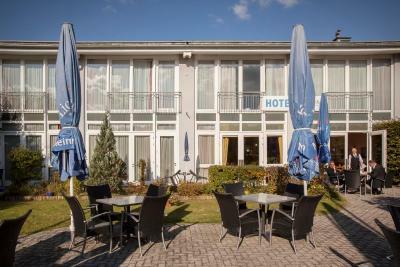 Room is a separate building about 200 meter from the reception and restaurant. 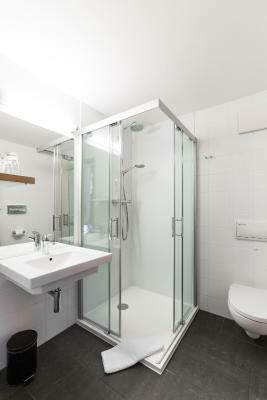 Shower cabine a bit small, but bathroom itself large. Maybe a little far away from city center, but not really a negative point. You know the location when you book the hotel, so no complaints. 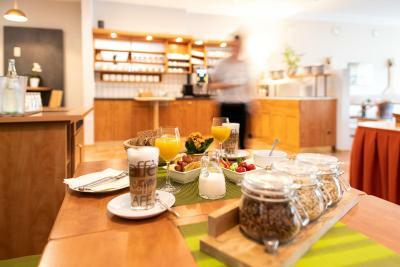 Quiet, comfy and clean rooms, superb breakfast. It was above our expectations - we have nothing to complain for. Great breakfast, friendly helpfull staff.